Reactor 4 at the Chernobyl Nuclear Power Plant, Ukraine, was destroyed by an accident in 1986. Shortly after the disaster, a shelter, also known as the sarcophagus, was erected to prevent the reactor wreck from leaking radioactive material into the environment. 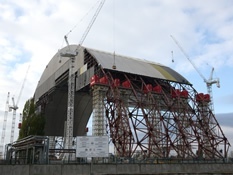 The sarcophagus deteriorated and was replaced by the New Safe Confinement (NSC), a sliding arch structure situated on tracks which was designed to: convert reactor 4 into an environmentally safe system; reduce erosion and weathering of the original shelter and reactor 4; lessen the consequences if the existing shelter or reactor 4 were to collapse; and facilitate the safe deconstruction of the unpredictable structures within the NSC. Prior to the construction of the NSC commencing, the uniquely designed roof structure needed both its materials and structural properties testing to ensure it met stringent and crucial project requirements and demonstrated how the components would interact within the system. The NSC is an arch-shaped tubular steel structure with an internal height of 92.5m, span of 245m, and length of 150m. The external cladding arrangement consists of two distinct assemblies; the outer and inner cladding. As an independent materials testing laboratory with extensive facilities and experience in roof testing, Lucideon was commissioned to test the individual cladding system components and design and build the rigs to test the entire cladding system. Lucideon assembled and tested each individual component and system layer for: wind-uplift loads (including Tornado Class 3 loads), imposed loads, impact resistance (including a novel 25kg snowball test), fatigue, air leakage, radiation stability, lightning strike resistance, and trolley loading. From the rigorous testing, Lucideon was able to confirm the chosen material and structural properties of the arch cladding exceeded the specification for the performance of the roofing system. The testing programme provided detailed reports, including: data analysis, in-depth measurements, observations, photographic documentation and videos.